50th wedding anniversary decorations are easy to get hold of, they are there in most party shops and online stores but rather than buying everything that they have, try mixing some of these ideas with the generic golden anniversary decorations that you can find. First start by looking at your venue, it could be your own living room or a very big ball room either way you will know the areas that you will want to decorate and those that you are happy to leave as they are. 50th anniversary balloons are a great way to add a splash of color and they can be displayed at different heights which makes them an easy decoration for tables, dancefloors and entrances. Golden paper lanterns are great 50th wedding anniversary decorations to hang from the ceiling to create a wow factor and use different sizes and hang them at different levels. You will need to play around with this and work out what works in your room, if you have low ceilings avoid hanging them too far. Photographs from the wedding 50 years ago and from the last 50 years are also a great way to decorate walls. Use A boards to display them if you have no wall space and try to spread the photos around the room so you don't end up with all of your guests crowding around the one display. If you are using your 50th anniversary party theme as the sixties then you could step back in time with posters and any memorabilia that you can find. You could use gold pillar candles and then surround the candles with gold colored glass pebbles or the 50th anniversary foil confetti. 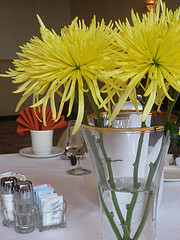 For a more traditional centerpiece then flowers are a big hit, you could have chrysanthemums, roses and gerbera daisies if you are looking for gold colored flowers. You can also use flowers in a more contemporary design by submerging the flowers in a cylinder vase and then have a floating candle on the top, or pack the flowers tightly together in a clear glass vase. Add extra decorations to your vases with gold ribbon tied around the center. You can also buy 50th anniversary centerpieces which you could surround with your party favors or place on top of a gold table runner or tablecloth. Photo centerpieces are also fun and a great way to get the conversation started. You could have a photo of each of your guests from the last 50 years and they could try and guess when they were taken, or at least where! And if all else fails decorate the venue with lots of sparkle and gold and enjoy the celebrations. Happy Golden Wedding Anniversary!